Why advertise on the Internet? Well, what's the other option? It's to place an ad for your business in a glossy brochure or one of those free English language newspapers that you find in various locations. You can imagine how much that costs - and the ad only lasts as long as the periodical it's in. Another thing to consider: potential customers don't get any brochures with your ad in them until they're actually at Tenerife Airport. There are people offering them to passengers as soon as they get off the plane. It's even worse for the newspapers - they're not available till the customer is actually in the resort! When you think of the alternative, to take out an ad on a relevant website, it'll cost a lot less and be a permanent fixture, viewed by many potential customers every day. But there's one over-riding thing to remember, which is very important. Those customers who may see your ads in the glossy brochures or free newspapers are already in Tenerife! They've already booked their flight, their accommodation, possibly their car hire. They might have already made up their mind about where they're going to eat out and what attractions they're going to visit. Your business needs to catch them when they're actually planning their holiday. And where do people go to find information when planning a holiday? They research it on the Internet! So, why advertise on this site in particular? After all, as of June 2013, there are 644,275,754 websites currently in existence (I looked it up). The Tenerife Information Centre's current Alexa ranking fluctuates between 1,000,000 and 1,500,000 - not bad, I think you'll agree. If you search for "Tenerife information", my site's there on the first page of search results. If you found the TIC, so will potential customers. 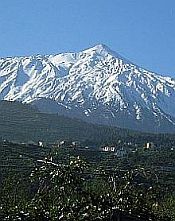 The Tenerife Information Centre has been live on the web since June, 2009 and is being constantly added to or updated. If you want to advertise, just fill in the form below. I'll get back to you and we can discuss terms. I'll try to make them very reasonable - promise! This is a basic text-link box. You provide your own "blurb". In addition to the website link, your phone number may be included. For businesses without a website, phone and email may feature. This can be placed on a page of your choice and you can elect to have it "above the fold", so that it's visible before any visitor has to scroll. This will be more expensive than ads "below the fold". This is exactly the same as Option 1, except that the link will open a new page on this site, with an in-depth review of your business. The new page will include a contact form and any responses will be delivered directly to you. With this option, you'll be able to include such things as photos and any copy you want (subject to editing by me). Once again, the options of above or below the fold apply. For both options, I will also accept banners (no animations, please). SOME COMMENTS ABOUT THIS SITE VIA "FEEDBACK"
Wow, I have to say, I love your site! Fantastic! Nice to have an 'impartial' viewpoint (I say impartial as you obviously love it!) but I know you're not just trying to sell me one attraction, but telling me all the ins and outs of it! I'm off to Tenerife tomorrow morning, and I have to say I must have read through your whole site today checking out the best places and warnings etc! So thank you very much, oh and if I find any policemen on the funny stand up scooters, I'll be sure to email you a photo! Thanks again! and well done! Came across your website looking for photos of Tenerife on Google images. My family have lived on Tenerife for 48 years and I must admit your website is certainly the most down to earth one I have read, even though it's more geared to the south (understandably since you lived there). I'm stuck in England now, can't wait to get back for good, one thing I must say is that you don't have to earn much to have a great lifestyle, but yes you must have income sorted before you move there. You certainly deserve to be made an honorary Tinerfeño! Great site and very helpful. I am seriously planning on moving to Tenerife in the next 12 months and have been planning it for the last 3 years...I have been researching my dream for a long time but unfortunately without being on the island there are limitations to find out the info I need. But I am massively greatful that you have taken the time and trouble to set up this great site. Just been on the Pets - bringing a dog to Tenerife site. Wow 10 out of 10 - this site is the best I have come across. We are moving to Tenerife in November 2010 and bringing our Boxer dog. So far details have been rather sketchy. Here I found all the telephone numbers and were able to talk to people direct. THANK YOU SO MUCH. What an amazing and very helpful site. I would not have thought of half of this if I had not visited it. You really have done a great job of explaining everything and I feel much wiser and safer going to Tenerife now. Thank you very much for everything. My very best wishes. I am about to experience my first holiday in Tenerife. Although I'm really excited about going, I didn't know what to expect. Thanks to your website, I'm now fully aware of all goings on and genuinely cannot wait to get there. Many thanks, John, you and your site have been a godsend. Hey John, great website - only wish I'd seen it before my holiday! Lots of really good information, particularly on the walking and wildlife. Looking forward to returning to this lovely place.